Innovative tech businesses from across Southern England, including 2iC Limited, Atom Universe, BotsAndUs, HOLM, Inovo Robotics Ltd, Stay Planner, Streeva, transparently from SETsquared Surrey, came together in London yesterday to pitch for £20m of investment to an audience of 150 investors at SETsquared’s annual Accelerating Growth Investment Showcase. “I am hugely proud of the success that businesses involved with SETsquared achieve on their pathway to growth. This year we have seen some extraordinary companies come forward with fantastic investment propositions. 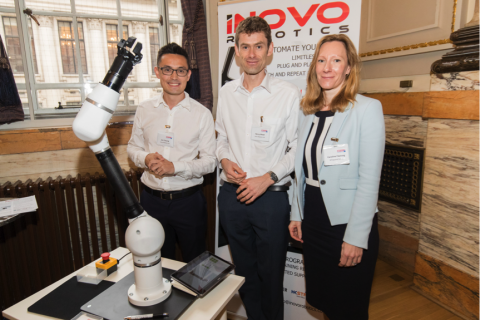 20 of the UK’s most exciting start-ups and scale-ups were at the showcase vying for investments of between £200k and £3m from an audience of more than 150 investors and corporates on 5th December 2017. The businesses pitching at the event have developed technology in the sectors of advanced engineering, VR, retail, healthcare, robotics and cyber security. Over the last 15 years SETsquared has helped more than 1,500 businesses raise over £1.25bn in investment, as well as contributing over £3.8bn in GVA (Gross Value Added) to the UK economy with £8.6bn GVA estimated over the next decade – figures that contributed to it being named by UBI Global as the top university business incubator in the world.